INTEGRATED introduces its Application Programming Interface (API), a tool that opens the door to a new chapter in custom analysis tools. 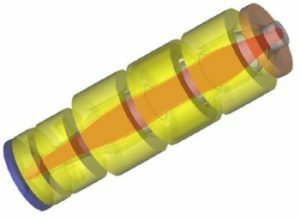 Our customers now have the power and the flexibility to integrate our CAE software programs to the applications they need for their design analysis. This customization will bring each particular electromagnetic/particle trajectory design to an even higher level of sophistication. This new capability provides users with access to the internal working of the software. The INTEGRATED API empowers engineers and scientists to write new analysis applications, customized to their own needs and ability. Through the INTEGRATED API, their own applications connect to INTEGRATED software without either application requiring knowledge of the inner workings of the other. The INTEGRATED API provides a whole new way to access the power of INTEGRATED software, in many cases enabling tasks that would be extremely difficult or tedious to do interactively. It is also a key building block for users to build custom analysis tools. A programmer can write a script or a full program describing how to build and analyze a type of problem with selected user controls and then invoke an INTEGRATED program through the API to do the analysis. With the INTEGRATED API, a part of INTEGRATED software since version 9.1, engineers have the tools to create their very own specific applications – at no extra cost. Our philosophy is in our name. Our programs are seamlessly integrated with each other. The INTEGRATED API enables you to integrate your own custom applications with our CAE software. The INTEGRATED API enables scripting, but also much more than just scripting. Users can write full programs and applications using their selected development environment to access the API. Scripting the INTEGRATED API can be done in simple environments, such as writing an Excel macro in VisualBasic. More sophisticated programming can be done with your selection of a full-featured development environment, such as VisualStudio. The choice is yours: scripts or full programs written in your own choice development tool. INTEGRATED API allows a variety of programs to work together in an interconnected environment. In this closely-connected world, we invite our customers to explore their creative side, and experience the many advantages the API has to offer.